It is said that the lead horse of any carousel is the biggest and most decorative of all of the horses. In the instance of the Gesa Carousel of Dreams, our lead horse is a magnificent and proud warhorse. 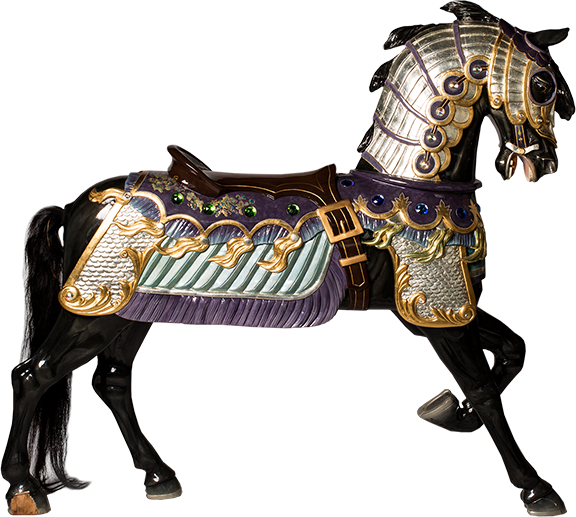 Beautifully adorned in protective neck and face armor, our majestic standing lead horse is a symbol of power and bravery, and is an impressive presence worthy of his lead position. Much like the unique attributes of the Gesa Carousel of Dreams lead horse, our United States military veterans possess the same amazing characteristics. Additional qualities of these military war heroes that should never be forgotten are loyalty, a commitment to service, and the willingness to give the ultimate sacrifice for the most worthy of causes. The Gesa Carousel of Dreams would like to offer all of the friends, families, and loved ones of our US Veterans, the opportunity to pay tribute in a unique, memorable fashion that will be displayed in permanence for many generations to come. The Breed Apart Commemorative Wall will feature a beautiful bronze plaque engraved with your US veteran’s name, dates of service, and branch of military. This is a chance to salute the brave men and women of our US military, who have made it possible for us to live our dreams in this wonderful country. Contact us today for more details on purchasing your plaque and reserving a place of honor so deserving of our vets.